U.S. tour in support of their upcoming release, Elephants on Acid. 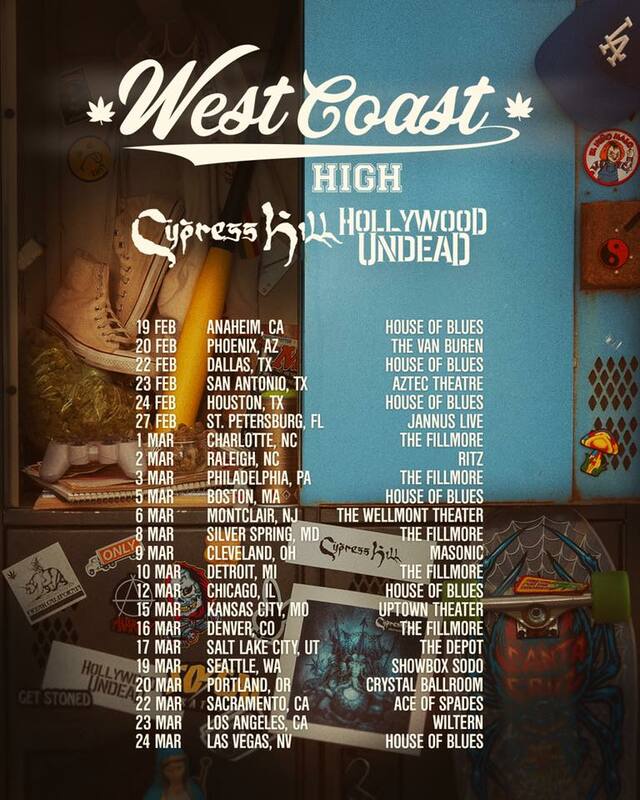 Hitting the road with Hollywood Undead, the “West Coast High” tour will kick off on February 19 at the House of Blues in Anaheim and will keep them on the road until March 24 when they wrap in Las Vegas. Artist VIP pre-sale will kick off on September 25 at 10am local time and will run through September 27 at 10pm local time. General ticket on-sale is September 28 at 10am local time. All tour dates are listed below and more information on VIP packages can be found at CypressHill.com. The band is also excited to announce an Indiegogo campaign for their highly anticipated documentary. Launching October 15, fans can help bring this documentary to life and in return will receive exclusive promo and opportunities. The long-awaited documentary will feature 30 years of unseen footage, photos and untold stories spanning their incredible music career. From their humble beginnings on the gang-infested streets of Los Angeles to their legendary SNL performance, fans will finally get to see the real story of what has made one of the most notable rap groups in history and get a first-hand look at how Cypress Hill sparked a movement and created a lasting legacy. Cypress Hill have also released their new single – “Locos” – today just a week ahead of the release of Elephants on Acid, which is currently available for pre-order. Fans who pre-order today will get “Locos” as an instant grat-track, along with the previously released “Band of Gypsies,” “Muggs is Dead,” and “Crazy” which was premiered on Power 106’s “The Cruz Show” on September 13.